This was always going to be a fun wedding to photograph! Vicky and Eddie are a fantastic, fun loving couple from Poole in Dorset, and had planned an amazing wedding day culminating in a great party at one of the UK’s best seafood restaurants – Shell Bay in Studland, Dorset. But before we even got to the church, it was clear that I was going to have to keep my wits about me if I was to capture just a fraction of the atmosphere and characters in my Shell Bay restaurant wedding photography. Starting at the Sandbanks Hotel, the guys were already in the bar when I arrived. There was a strong colour theme present throughout the day, starting with multi-coloured cravats, coupled with another key ingredient of the wedding celebrations – alcohol! A short time later I was amongst the mayhem of a house full of bridesmaids and family members helping Vicky get ready before the ceremony. I love a busy house for the preparations – as a documentary wedding photographer theres always so much to photograph, and this was no exception. Now, Vicky’s the kind of Bride who has detailed plans in the run up to the wedding, then goes with the flow during the day itself. Some things are just out of your control, and it takes a special kind of person to keep smiling when plans don’t turn out as expected. So when the forecasted rain arrived, no problem. We were hopeful for some clear patches later in the day so we could take advantage of the nearby beach for some portraits. When the double decker bus didn’t turn up, it really could have upset lesser brides. But the wedding party just altered the plans, cars were summoned, and everyone made it to the church on time! 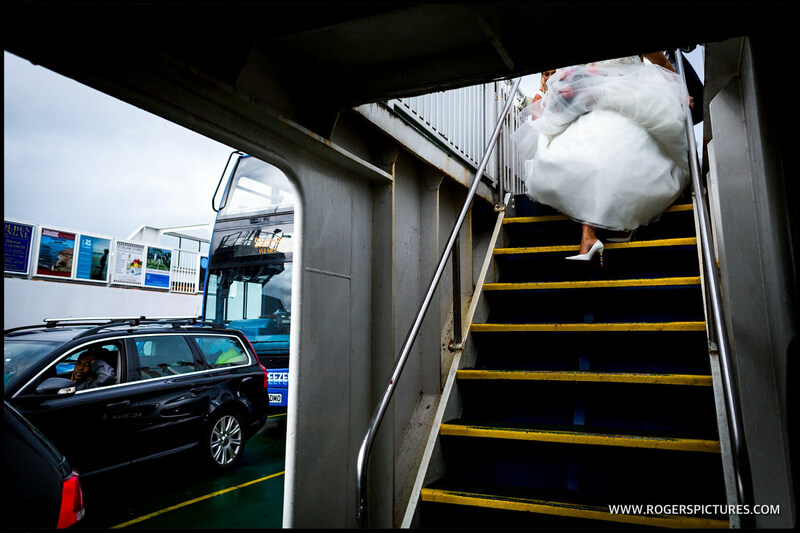 By the time the ceremony had finished, the bus had arrived and was ready to whisk the first group of guests over to the chain ferry to nearby Shell Bay. But not until we’d photographed the balloon release – some really bright colours to lift everyone’s spirits as the overcast sky loomed. Once at the ferry terminal, there were lots of car honks and congratulations from well-wishing members of the public before we boarded to the short hop across the channel and quick walk over to Shell Bay Restaurant. Book Me For Your Shell Bay Restaurant Wedding Photography? We did manage a few portraits down on the beach before the evening party kicked off with music, dancing and a Vodka Luge! If you were a guest at this wedding, be sure to check out the slideshow to see even more images, or the Full Gallery. And if you’re planning a Dorset wedding, or one anywhere else and love this kind of natural, unposed wedding photography, please fill in my contact form for more information and prices. Here’s a few more of my favourite Shell Bay Restaurant wedding photography. Or you may be interested in some Surrey garden marquee wedding photography, or perhaps this Fredericks Islington wedding.